I think my Squirtle is so cute, much cuter than my other Pokémon. Lately, however, I've been having some behavioral issues with him. He's become moody, temperamental, and just the other day he squirted my backside while I had it turned. Do you have any advice to make me close with my beloved Squirtle again? I'm sorry that you've been having trouble with your Squirtle. Unfortunately, I see this problem all too often these days. Pokémon trainers add a Squirtle to their team thinking that it will be a lovable, sunglasses wearing scamp who takes the lead in a pinch and forms the linchpin of their team only to find out that Squirtle is actually an uncontrollable wild creature who doesn't follow anyone's rules. Lucky for you, I have some ideas that may help! First off - always keep in mind the mnemonic my friend John taught me, "A Squirtle is a combination squirrel and turtle, and he squirts!" You can see the squirrel in the curliness of his tail. This is where he gets his frisky nature from - full of energy and playfulness, never resting until the sun goes down. His primary form is the turtle, making him a Water-type and powering up those Water-type moves. He squirts - don't get a Squirtle unless you are prepared to occasionally get soaked. Please make sure you have a pool, pond, or large bathtub for your Squirtle to relax in. A stressed out Squirtle is a disobedient Squirtle! Make certain you're giving him the right toys to play with. In the general population, only 12.5% of Squirtles are female. If you've been giving your Squirtle dolls and lipstick for play you may have made a huge mistake there. Next - how are you doing on gym badges? I know, I know, you've been keeping your Squirtle from evolving but leveling him up like mad. A Squirtle can get to Hydro Pump at level 40 while Blastoise doesn't learn that move until level 60. No one wants to snuggle a Blastoise, I know! If you don't have the right gym badges, though, you are going to have difficulty getting a higher level Squirtle to listen to you. I'm not saying evolve the dude right away, maybe just hit the road and earn his respect. Are you training your Squirtle the right way? Did you know that, throughout its evolutions Squirtle maintains its strongest base stats in Defense and Special Defense? If you push your Squirtle to be an attacker (either Special or Physical) he may be getting stressed out since he knows he'll never be able to fully realize the areas where he has real potential. Do not neglect Squirtle's natural calling and he may turn out a little happier. This is most important if your Squirtle has a Bold nature - it inherently boosts his Defense and hinders his Attack. Know your Squirtle's ability. He can either have the attack focused Torrent (boosts Water-type moves when HP drops below a third of max) or the more defensive Rain Dish. 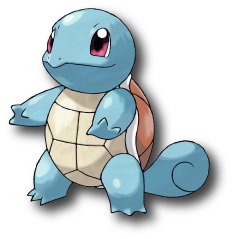 I know it is a little late for you, since you already have the pal you've been working with and would never trade him for any other Squirtle, but for trainers who haven't gotten their first Squirtle yet I'd look for one with the Rain Dish ability. Rain Dish restores a sixteenth of maximum HP when it's raining out. Having that extra defensive capability is definitely going to allow your Squirtle to live a happier life. Squirtle can learn some moves that are definitely mood enhancers. Rain Dance is right up there if he has the Rain Dish ability. Whenever he's feeling a little down in the HP he can dance it back up again 1/16 every turn - if the rain lasts five turns that means 5/16 HP restored! Definitely Hydro Pump if you want Squirtle to pack a wallop (I personally prefer Aqua Tail, that little squirrel tail needs to be used for something!). If you have focused your Squirtle on a lot of attack moves, at least give him Iron Defense to accentuate his natural defensive strengths. Squirtle can also learn Fling. One thing I've learned, if you get hit in the face with an Iron Ball you're going down. Other tactics to boost friendship with your Squirtle: keep him in a Luxury Ball. Let him hold a Soothe Bell. I would avoid those nasty Pomeg, Kelpsy, Qualot, Hondew, Grepa, or Tamato berries - never any sense in sacrificing EVs to boost your friendship (unless you erred in your EV training . . .). A Rindo berry may make your Squirtle sleep a little better knowing that he won't get hit as badly during a Leaf Storm. Lastly, I don't know, if he likes pretty things - a Dark Gem? If you can only use Fling once, may as well have it at 195 base power, no? Finally, some would say most importantly, do not speak to your Squirtle in French. They hate that. Even the french Squirtles would prefer to be spoken to in any other language. Well, All Wet, I hope that helps. If not, maybe you can find a more experienced trainer and trade your Squirtle for another Pokémon that you will grow to love. Eventually. Some day. If you have a Pokémon relationship question, we're here to help! Send your questions somewhere. Next week PKMN of the Week will be at the National Championships and we will have a guest writer.